1) Lutein & Zeaxanthin - these are specific carotenoids found in the macula (the central part of the retina). In the eye, lutein and zeaxanthin absorb blue-and UV-light, protecting the macula from their harmful effects. Commonly found in leafy green vegetables (i.e. kale, spinach, etc), egg yolks and orange peppers. Research shows that lutein can improve visual function for individuals with age-related macular degeneration and protective against cataracts. 2) Omega-3 Fatty Acids - decreases inflammation in the body and may reduce the risk of age-related macular degeneration and therapeutic for patients with dry eye syndrome. Commonly found in flaxseed oil, salmon, and vegetable oils. 3) Vitamin C - is a water-soluble antioxidant that cannot be stored by the body. Diets high in Vitamin C and other antioxidants have been shown to decrease the risk of age-related macular degeneration and decrease the risk of cataracts. Commonly found in many fruits and vegetables. 4) Beta-Carotene - carotenoid that the body converts into Vitamin A and helpful in reducing the risk of cataracts and age-related macular degeneration. Commonly found in carrots and sweet potatoes. 5) Vitamin E - is a fat-soluble antioxidant that may reduce the risk of cataracts and age-related macular degeneration. Commonly found in oils, eggs, some fruits and vegetables. 6) Zinc - supports the immune system and the healing process. 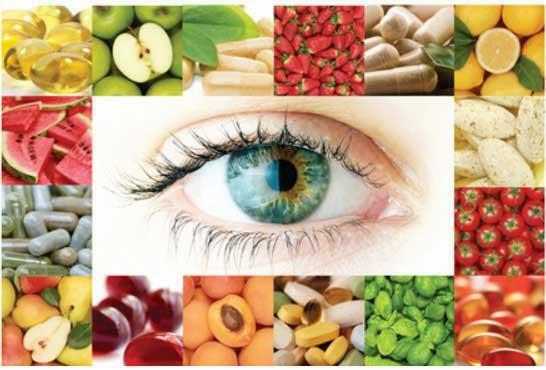 Antioxidant supplements are shown to decrease the risk of progression from intermediate to advanced macular degeneration by 25% (AREDS study). Commonly found in red meat and poultry. At Beverly Hills Optometry, we offer dry eye supplements (triglyceride fish oils - recommended 1000mg-2000mg/day) and other high quality eye vitamins for our patients. Contact us at 310-734-3446 or go to our website, http://www.bheyeguy.com, to see a list of our services.